Mr Green Casino has been entertaining online gambling fans for a good few years. Though it started out exclusively for a Swedish audience in 2008, it went international in 2012 and has made quite a name for itself amongst this wider audience, although it’s not available to USA players yet. 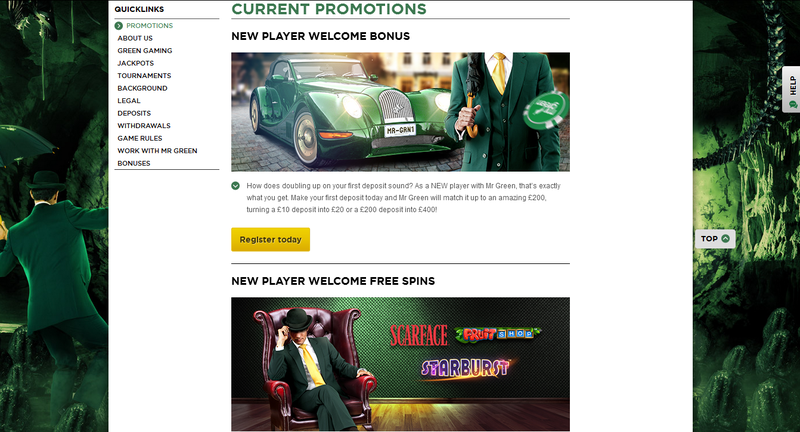 Even though the site is called Mr Green, the casino website is not overwhelmingly green as one might expect. In fact it just has hints of green in key areas which works really well as a design element. The nattily dressed Mr Green is often seen on the promotion banners and gives the site a definite touch of class. Generous bonuses, a fantastic array of casino games, slots and other games, a good VIP programme for loyal players, and regular promotions are some of the attractive features of this online casino. This is a ‘no download’ casino which means you can play all the games here directly via your browser without having to download anything. Just log in and start playing. Great news for mobile players, a scaled down version of the Mr Green Casino can be downloaded to your mobile without any difficulty. Mr Green Casino is registered in Malta and is powered by BetSoft Gaming software. The site offers games from multiple software platforms including IGT, Microgaming and NetEnt. If it’s variety that you are after then you will be in luck as there are more than 200 games, providing a really wide range of choice. Video slots, Roulette, Blackjack, Live Games, Poker, other assorted games and jackpot games make up the list of options available at this casino. Find the newest releases and the most popular games on the home page. New games are showcased right in the centre of the home page followed by Suggested Games just below. The Top Rated Games are also given prominence on the home page. If you would like to see the full list then just click on the All Games tab on the top of the page, this will show you all those available. The new player bonus is a reasonable but maybe not unusual 100% up to a maximum possible bonus value of £100 available over your first deposit – PLUS receive 100 FREE Spins on Mr Green Moonlight when you deposit & play just £20. Mr Green also has regular ad hoc promotions on offer, so it is vital to visit the promotions tab each time you visit so that you don’t miss out. The VIP program at Mr Green is called the VIP Lounge, and as it is aimed at high rollers it is offered to players by invitation only; that said, any player who is already a VIP at another casino can apply to be included. Benefits include, a dedicated account manager, faster withdrawals, special events, cash back offers, promotions and a birthday surprise. Mr Green has quite an impressive library of games and there are progressive jackpots and regular special offers to add to the general excitement. Most of the games have a play for fun option so if you need to play a few practice rounds before you wager real money, you can. Every game icon also has a rating scale below it showing how much a game has been rated; look for the line of green hats – the more hats, the better the game. The games are sorted not only according to category – slots, poker, roulette, etc., but also according to themes such as enchanted and classics, making it really easy finding the individual games. Find the list on the left side of the screen under the All Games tab which you will find at the top of the home page and all pages on the website. Navigation is easy and the site is well laid out so finding the different sections is quite easy. The game shortcuts take up most of the space with detailed graphics and a short summary of the game that is highlighted by hovering the mouse over each icon. The slots cover games of every theme from fantasy to fruit machines, ancient civilisations to comic book heroes and lots more. There are more than a dozen versions of roulette, and even more versions of blackjack. The Live Games include Baccarat, Blackjack, Roulette and Poker. Choose from more than 20 Poker rooms or have fun playing Bingo, Pai Gow, Craps and Keno which you will find listed under Other Games. The Jackpot Games tab has all the big progressive jackpot games across all the categories with prizes going up to six figures in some cases. What do you think of Mr Green? 100% up to £100 on your first - PLUS receive 100 FREE Spins on Mr Green Moonlight when you deposit & play just £20!